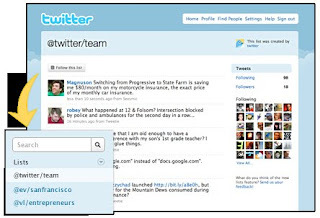 Online Marketing for businesses with big ambitions: Twitter Lists; will your business benefit? Are you one of the special few that have been invited to try out twitter Lists? If not, don't be too disappointed; it will be made available to all twitter users in the near future. Nick Kallen, of twitter and leading the project development of the List's feature, explained earlier this month how people have been contacting twitter requesting a way of organising those they follow (many users have turned to 3rdparty applications to help them manage their twitter accounts). The result is Lists, an easy to use feature which allows you to create (and name) lists and then populate those lists with specific people that you follow. Lists will make it easier to organise those you follow and will allow you to share your lists with others. For example a fashion magazine might have a list of all the top high street stores; readers of the magazine can then follow that list (good for the magazine, the high street shops and great for the reader!). A business could benefit by keeping a closer eye on specific teams or projects or a Soho bar could list all the other local bars and clubs (competitors) to keep an eye on what they have on offer. There are plenty of possibilities. And of course being put on a list is great news. Others are essentially flagging you on twitter saying "follow this person, their tweets are fantastic". However, Lists hasn't won everyone over. Many have already commented about the limitations. For example, when you view someone else’s list there is no way of knowing what's made everyone on that list unique and why they’re featuring on it. Some form of comment feature is missing. Have you suffered with spam from twitter? If so (and I’m sure that applies to 99.9% of you), you know how annoying it is. Therefore the thought of lists being created so people can trawl specific interest groups does instil fear that spammer will increase. I think those already using 3rd party applications to manage their account will wonder what all the fuss is about. Simply put, I’m not sure Lists goes far enough to convince those using twitter for business. On the other hand, Lists is in the testing stage and that’s what testing is for!